When artist Mohammed Ali’s father came to Birmingham from Bangladesh in the late 1950s, it had been a decade since India had become independent from the British Empire, which had in turn led to partition and the formation of Pakistan, which itself was formed of two regions one of which was East Pakistan. Beset by political infighting by 1958 East Pakistan was under military rule, which was the final straw for many Bangladeshi men, like Ali’s father, who decided to start a new life in Britain (the country would later fight a devastating war of independence and declare itself the People’s Republic of Bangladesh in 1971). Now 60 years later, Ali’s community organisation, Soul City Arts and Future Seed CIC, have captured the untold stories of those pioneers (and those who came before them), who made their way into the restaurant industry and began serving up Bangladeshi cuisine. 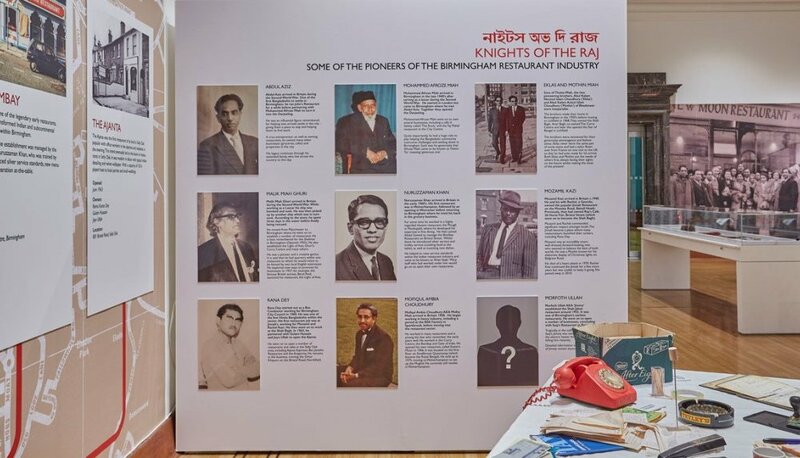 The exhibition retraces the origins of the Birmingham curry trade back to the 1940s, when a Bangladeshi migrant, Abdul Aziz, acquired a British restaurant and added curry and rice to the menu – this was later rebranded as the city’s first proper curry house, The Darjeeling, which opened in 1954. 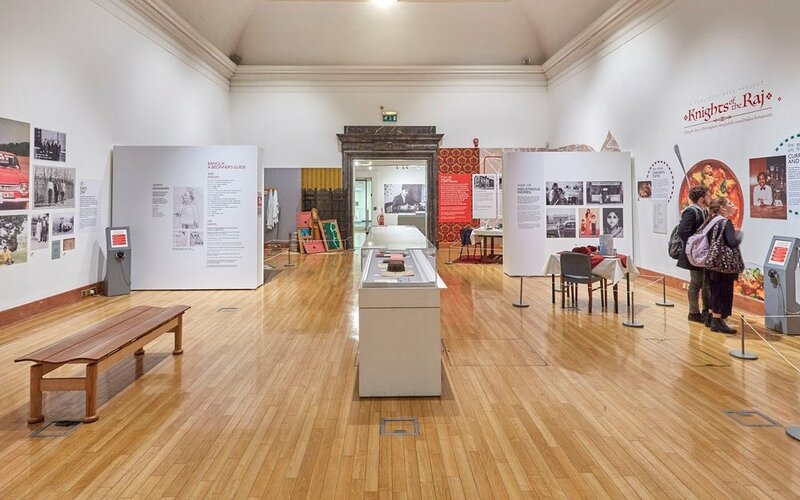 Through first-hand accounts – many of which are from recorded interviews by Ali over the past decade – photographs and furnished interiors of a restaurant booth, kitchen and the ‘boss’s desk’ the exhibition is a colourful and informative snapshot. 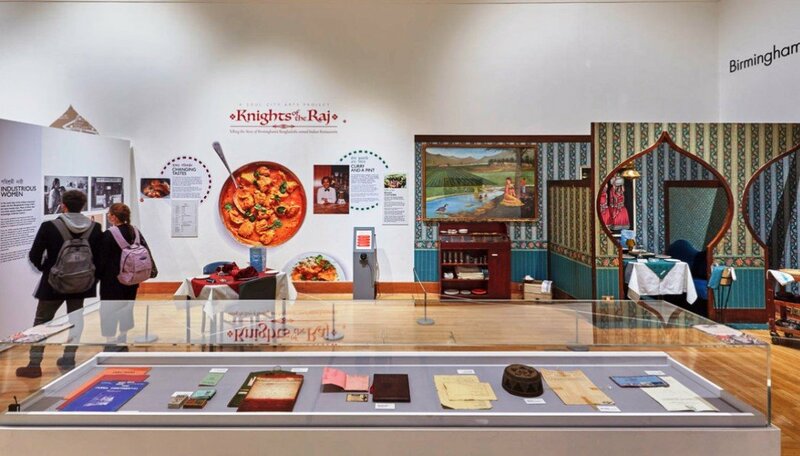 Knights of the Raj, which opened in September, not only tells of the rise in popularity of these Bangladeshi restaurants but also the struggles of the Bangladeshi community in finding its identity in Britain, which includes the industrious women who followed their husbands. In the 2011 census there was an estimated 35,532 Bangladeshis living in Birmingham, the largest concentration outside of London, and it is testament to Ali’s work as an artist and his own struggles with his identity as a British Bangladeshi that this story is now being told. This exhibition is a milestone not just for Bangladeshis in Birmingham but across the whole country and internationally, says Ali. He also says the exhibition will travel to New York as the Bangladeshi immigrants there have heard about it and want to adapt it. Ali is currently in talks with an arts organisation and will be carrying out research and development in January. There is also interest from an art gallery in London that wants to incorporate elements of the story into a similar exhibition. Ali says possible reasons for this story not being told in such a way before is that the BAME communities is not being given the attention or development that it needs to tell its stories and that those communities perhaps don’t see their place in the museums and galleries. Ali is known for his murals and community work and was awarded an MBE in last year’s New Year’s Honours List for his services to art and community cohesion. In the past few years he has also been working more and more with heritage organisations and museums to bring communities together. In 2016 he collaborated with Archives West Midlands on a project called Strong Rooms, which saw him tour two shipping containers around the midlands to showcase the exceptional stories of local individuals through art and historic documents. That this was a wake up call for him and on his return to Birmingham he couldn’t get this experience out of his head. He decided it was time for him to reclaim the narrative of what it is to be Bangladeshi and also give a voice to other marginalised communities through his art. As part of his work on murals over the past decade-and-a-half, Ali had accumulated hours of recorded interviews with the Bangladeshi community that he used to inform his work and realised there was an important story to be told. 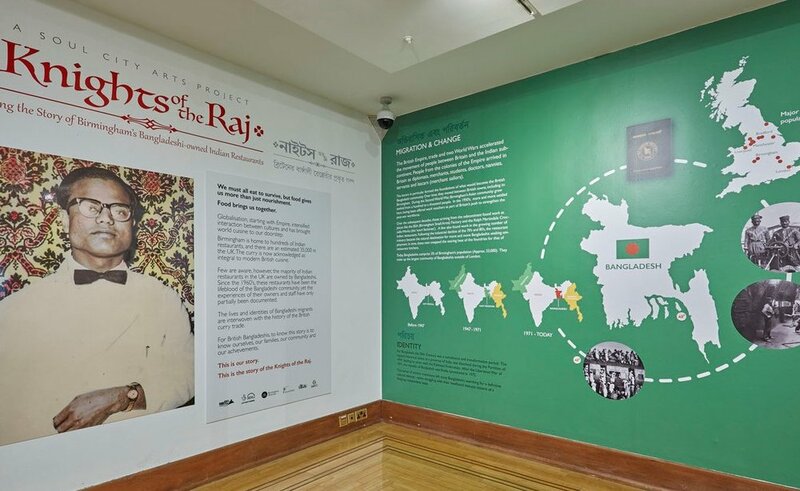 The whole process of developing the exhibition has been an affirmation for Ali that it was his community that was taking over part of a prominent city space and that this Bangladeshi story was finally being told. Following the exhibition many of the photographs and the audio interviews will be archived at the Library of Birmingham as part of the agreement of this HLF-funded project. Some of the physical objects such as the booth from the Koor-i-Noor, a restaurant that opened in 1962, has been acquired by the museum as part of its Collecting Birmingham initiative. Knights of the Raj runs at Birmingham Museum and Art Gallery until 7 January 2018.